Revolution Field Hockey, a USA Field Hockey Partner Camp, is proud to announce we will be hosting a new, 2019 day camp at George Mason University in Fairfax, Virginia this summer. Come and train from 9 am – 3 pm (10 – 17years old) or 9 am – 12 pm (6-9 year olds) and take your game to the next level. Campers will train on the George Mason University turf athletic fields and enjoy what a Division I school has to offer. Every camper will receive a limited edition reversible jersey, ball, water bottle, and lanyard as well as other fun prizes. *Revo Field Hockey Camps are open to all ability levels. Ann Andrews was named the head coach of the Hood College field hockey program in July of 2018. Andrews comes to the Blazers after a successful six-year run at Severna Park High School in Maryland. She coached Severna Park to back-to-back-to-back Maryland 4A State Championships from 2013-15. Andrews was a two-time coach of the year via the Washington Post and earned similar honors from both the Baltimore Sun and Capital Gazette. Andrews was a site director for the United States Field Hockey Association from 2015-18. From 2010-16, Andrews was the club director for the Strom Chasers Field Hockey Club, helping start the Annapolis-based program from scratch. The Storm Chasers rose to the third-ranked club in Maryland and No. 54 in the country during its first five years of existence. 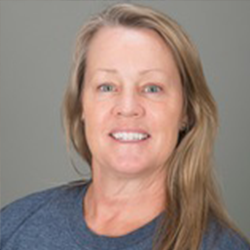 She has a USFHA Level II Coaching Certificate and earned certification from the National Federation of High Schools in heat acclimation/heat illness prevention and concussions in sports. Andrews is a certified personal trainer and fitness nutritionist by the National Academy of Sports Medicine. A graduate of Notre Dame (Md. ), she earned a bachelor’s degree in communication arts and postgraduate certification in secondary education. Andrews was a two-sport student-athlete for the Gators, earning team captain and team MVP honors in both field hockey and women’s lacrosse.